A Solar Heat Exchanger is an effective way to transfer heat between two different liquids. The liquids can have different physical properties such as water and glycol or they may need to be separated because of different operating pressures. Whatever the reason our solar heat exchangers allow the transfer of energy, efficiently, with virtually no heat loss. 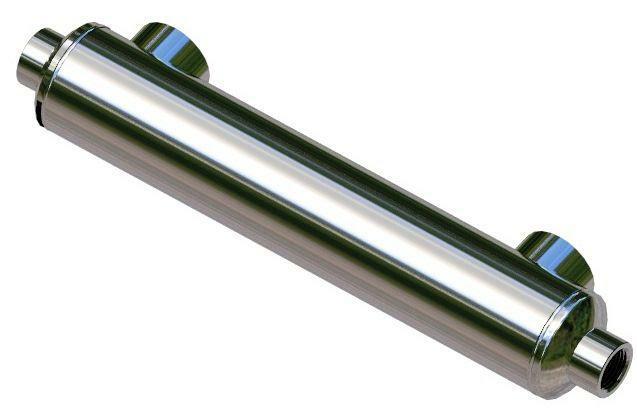 Used for Solar Pool and Hot Tub Heating applications. 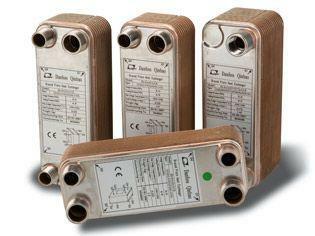 Three variables are important in transferring energy when using a solar heat exchanger. Flow rate of the two heat transfer fluids. Increasing the surface area will decrease the temperature difference between the two sides needed to drive the heat transfer or the greater the power the heat exchanger can handle for a fixed differential temperature. Increasing the flow so that it is more turbulent improves the heat transfer, but mostly it determines the differential temperature from in to the out ports. The less restrictive the heat exchanger is to flow (the lower the pressure drop) the lower the wasted energy required to pump the fluid through the heat exchanger. Brazed plate solar heat exchanges have approximately the same pressure drop on each side, and provide for a large heat transfer area given the volume of the heat exchanger. the pool type solar heat exchanger is designed to handle high flow and produce a small pressure drop on the pool side of heat exchanger. 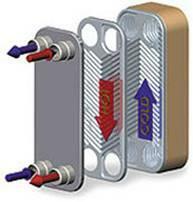 The physical direction of the flow in the heat exchanger is recommended to be in opposite directions. This is known as Counter Current Flow. 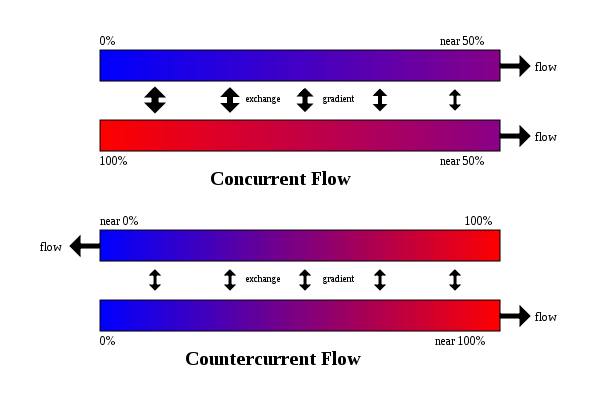 Hot and cold fluids running in the opposite directions create a more uniform differential temperature gradient across the heat transfer area and this often leads to greater heat transfer than if the fluids ran in the same direction (concurrent). This is why in solar heat exchanger applications the hot and cold should enter from opposite ends.